Ahh.. the weather is warming... everyone is getting a little excited for summer.. including the teacher. This is our last week of preschool. Can it be? 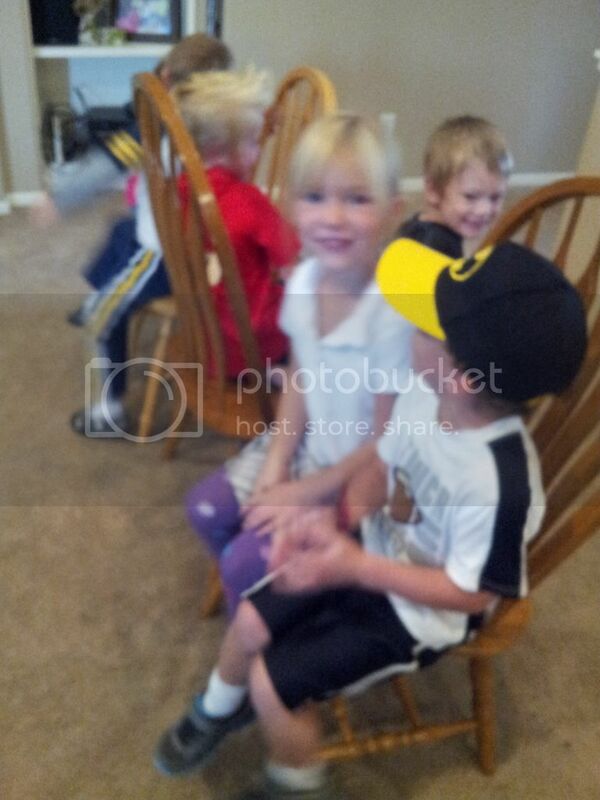 My little preschoolers have grown so much! 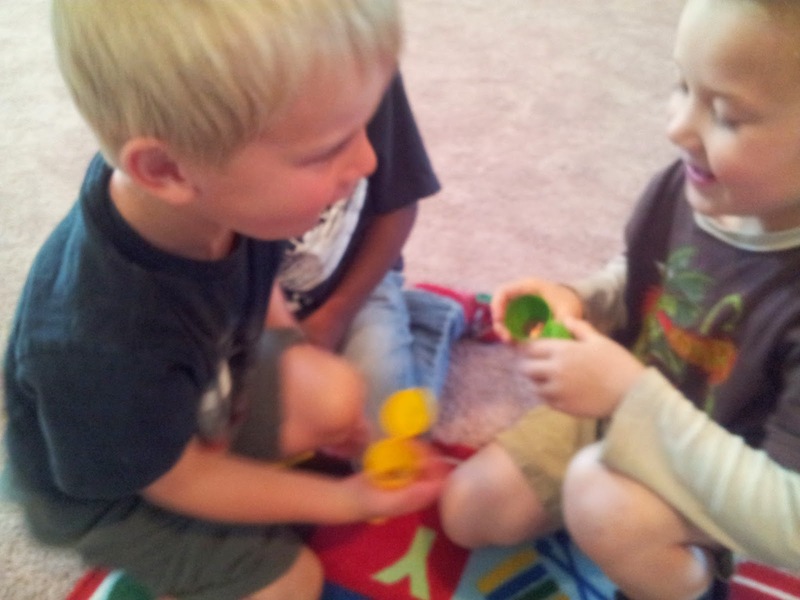 There are so many things I love about Funshine Express preschool curriculum. It is such a well thought out program. But one of the items I personally loved- was the art projects that were just exploratory. Today we did a fun, simple painting project. Funshine Express calls it Crease and Paint. Our little guys folded paper in different ways. (There is no wrong or right way to do this.) 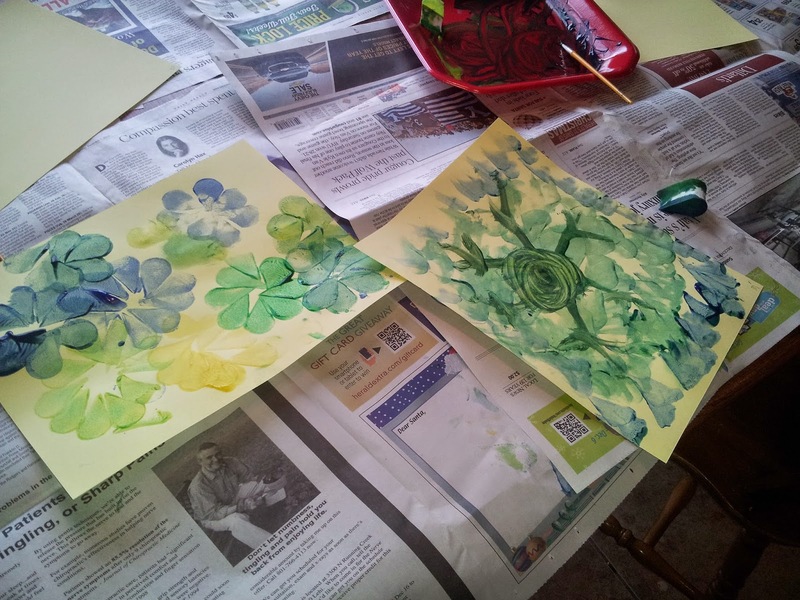 Then they open up their paper and paint in the creases. It is simple, yet keeps their attention and imagination inspired. I know if I just tossed out paint and brushes this last year, the children would be stuck in a rut. They would have gotten bored with painting. 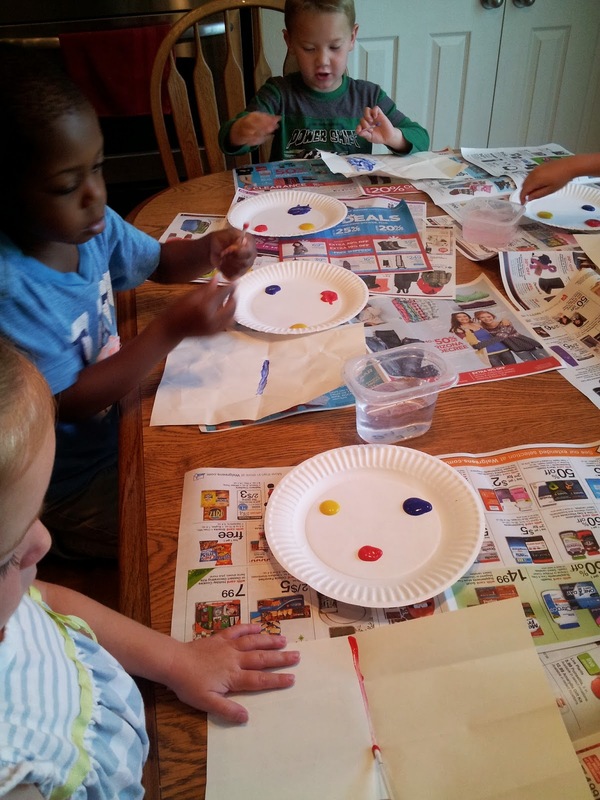 Because Funshine Express have provided different ideas each month- my preschool kids love painting! They can't wait to see what we are going to do each time I pull out the paints. And it might just be me... but I love art work by children. The free expression makes me happy. I gave every child a paper plate with the colors red, yellow and blue. Some kids like to mix the colors , some don't. The kids who mixed the colors- wanted to take their paper plates home too. I don't blame them. If you are looking for other unconventional art, here. Every month Funshine Express includes a cute book that relates to the theme. Today we talked about seeds and planting gardens. The last row of mature plants is represented by flowers. We put real seeds in wet paper towels. Next week we will check them sprouting and then plant them in dirt. Funshine Express has such a well rounded curriculum! I threw my back out- during spring break and I am still in a lot of pain. I found out I have scoliosis in my lower back and it is making walking and bending, lifting and moving in general difficult. I am working with a physical therapist and chiropractor and recovery has been s-l-o-w. The reason I tell you this? 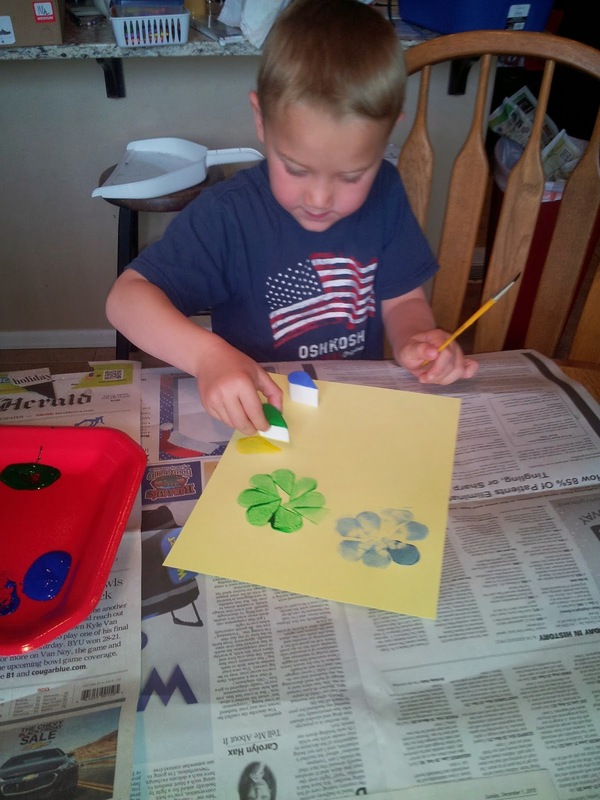 I planned and expected to modify and add so many fun activities this year of preschool. I really wasn't planning on depending on my Funshine Express monthly curriculum kit like a life-line. Yet a life line- it has been! 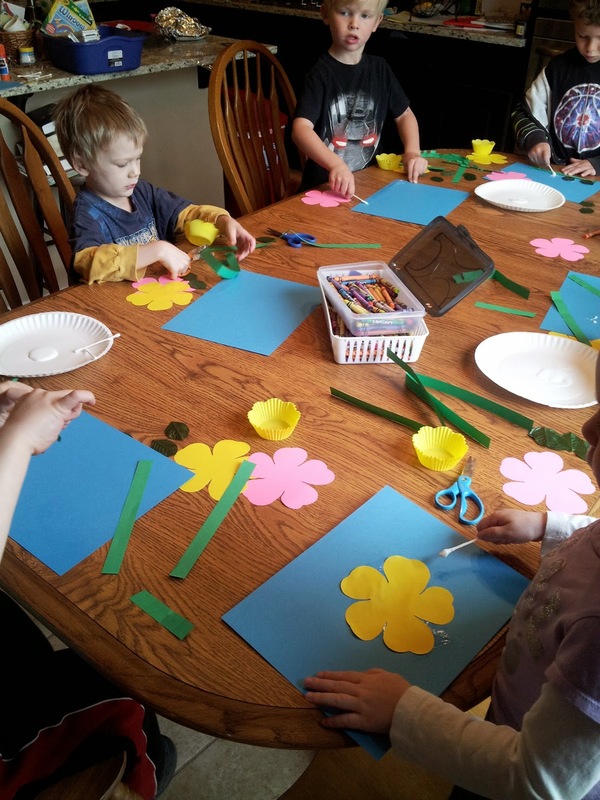 Funshine Express has so many cute activities leading up to mother's day. Here are pictures of one. The kids had fun personalizing these mother's day cards. 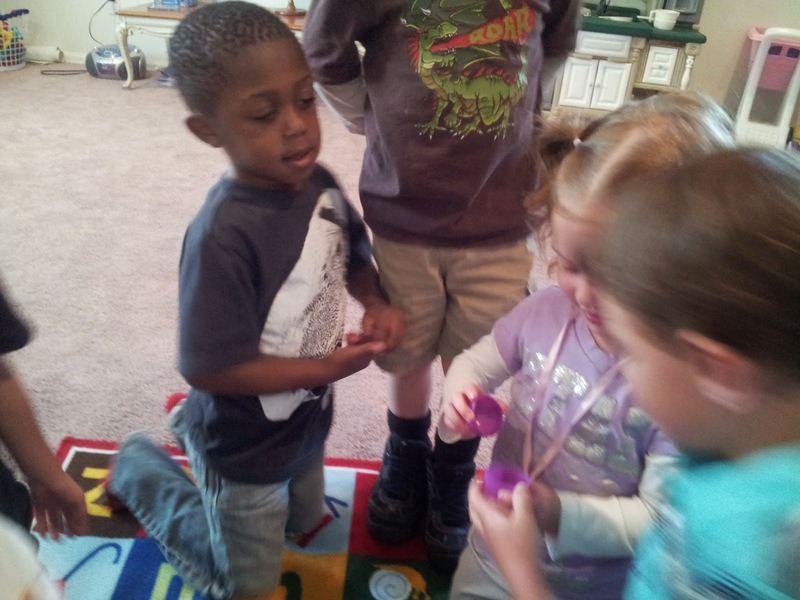 Today in circle time- everyone got to share what they did- to celebrate mother's day. The kids were so excited to share. I am daily amazed by my little preschoolers. They are so fresh and authentic. I love this age group. They help me see the joy in the small - every day things. 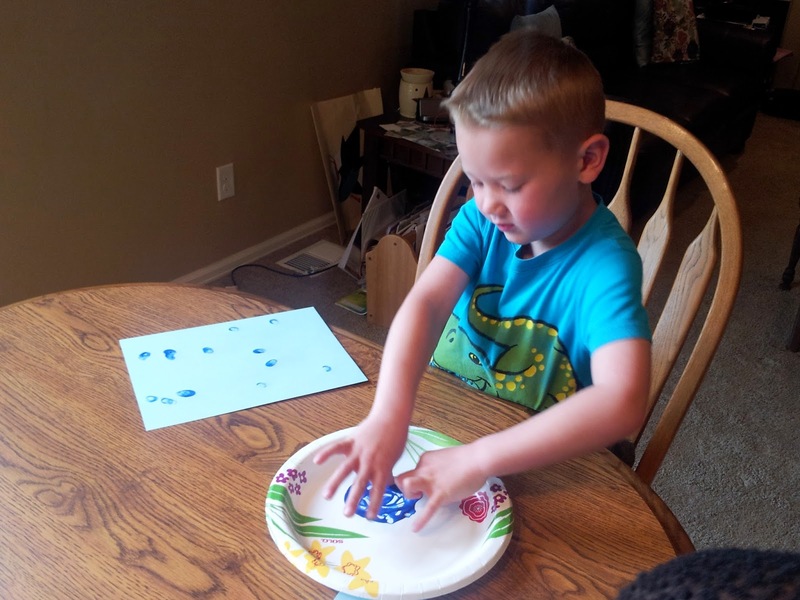 Today we had a fun painting activity provided by Funshine Express. 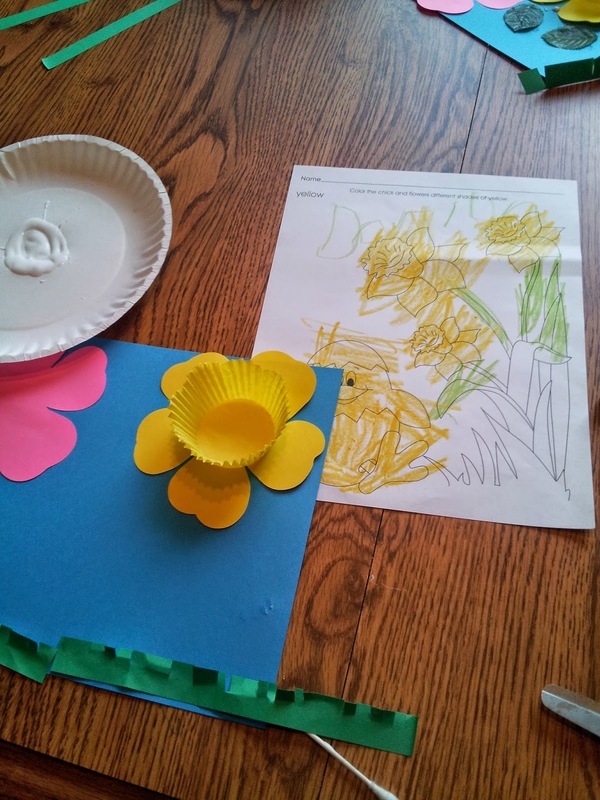 In my monthly curriculum kit- Funshine Express provided the paper and petal sponges. I provided the paint. This young artist- always creates amazing things. He painted both of these. The one of the right is a magnified view inside a flower. 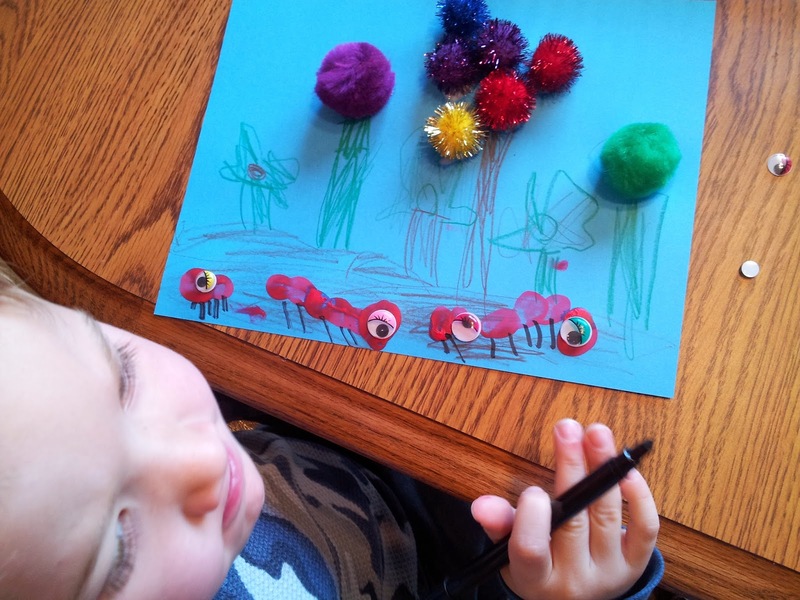 I just adore children's art- and always look forward to seeing what Funshine Express has planned. This is my last month of preschool. I opened my box... fully expecting to see the monthly regulars. I browsed through the plans this month... and fell in love with Funshine Express all over again! Funshine Express calls it, "Evolving Picture Story". 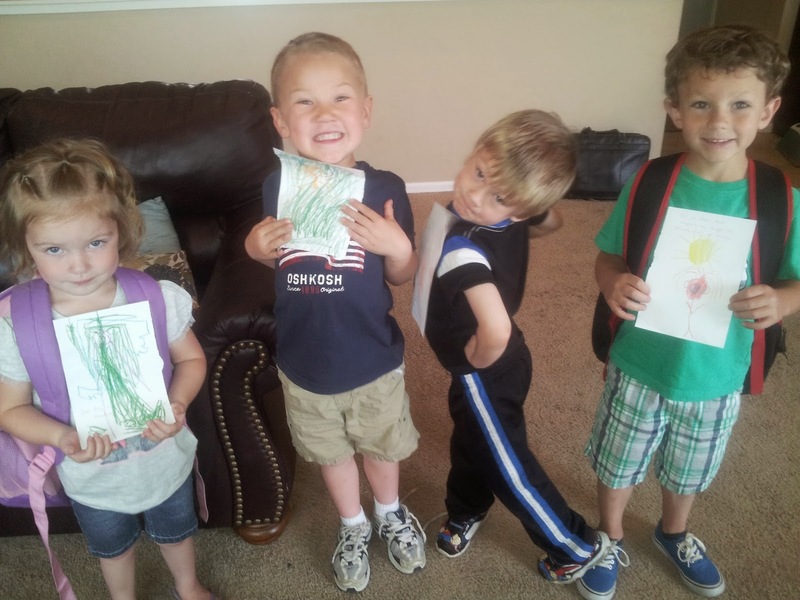 My kids called it- "we draw the pictures- story"
Funshine Express provides a simple story. Then I gave one page to each student- to illustrate. They l-o-v-e-d this! This fella made the grass super tall in his picture. Then during our story time- I put all the pages together and read it to them. I kinda wish we had done this every month. We would have quite a collection of stories by now. 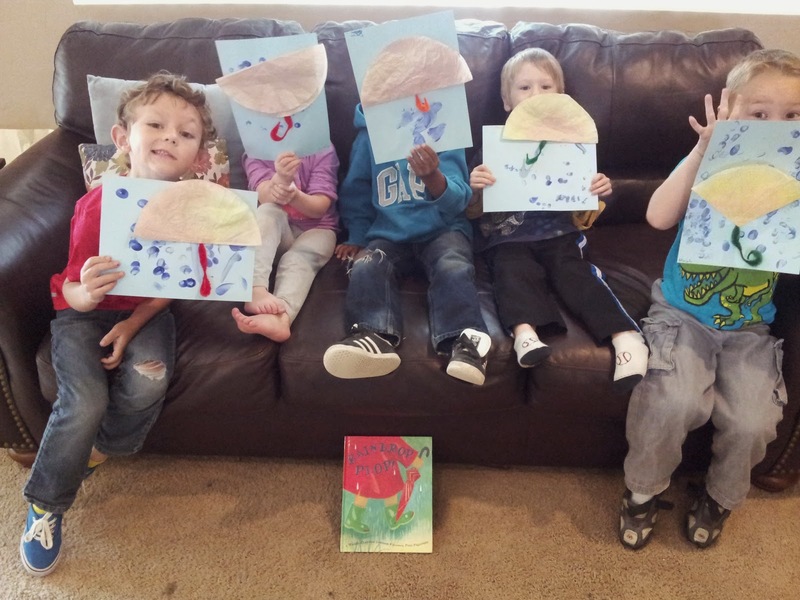 They all agreed that they wanted to keep the pictures together at preschool, so next preschool day we can read it to the preschool friends who were sick. They are sooooo proud of this story they illustrated! This month we have been learning about OVALS. 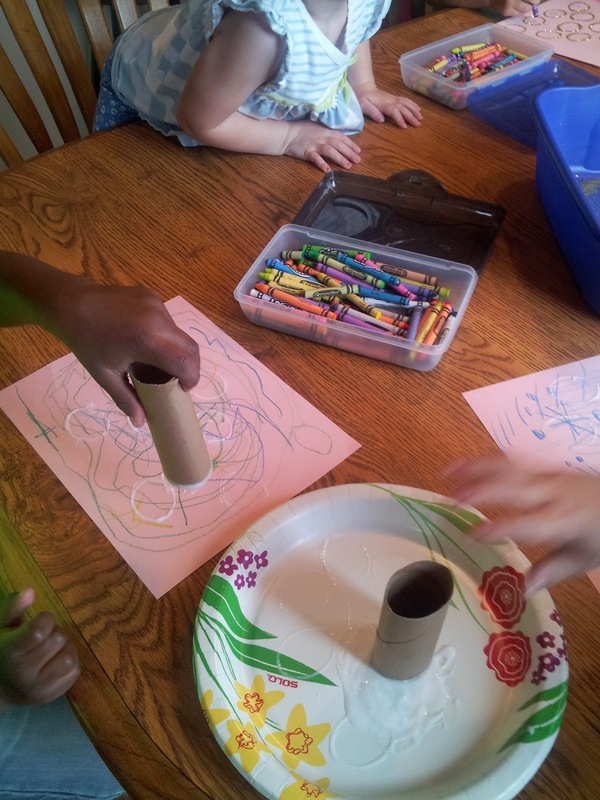 Funshine Express provided these cardboard tubes for this activity. I squished the tube- to make them the shape of ovals- instead of circles. 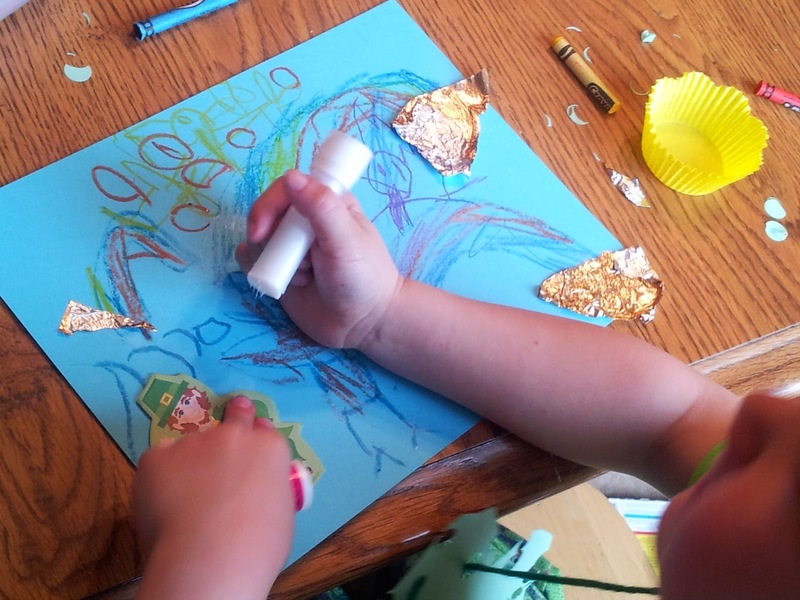 I told the story of the Goose who laid Golden Eggs, while the kids created their pictures. I highly recommend having some kind of tub- when using glitter. It contains the mess nicely- AND it is easy to funnel back into the glitter baggy- to be used again in a future project! Glitter makes the ordinary into extraordinary. 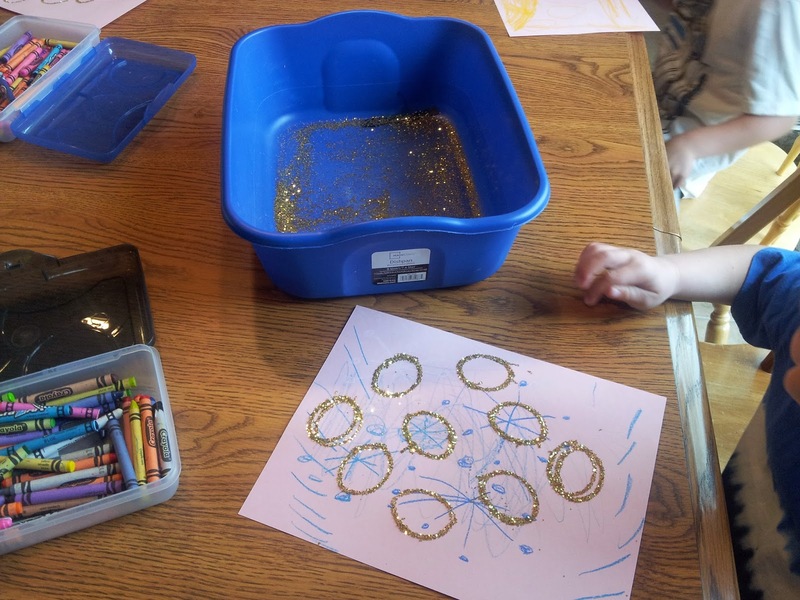 THEY LOVED these gold ovals! There are lots of cute books involving eggs. Today was officially "crazy weather". It was blustery and SNOWING! I don't mind- I will gladly take a few freak snow storms, if I can have a few days of spring sprinkled here and there. 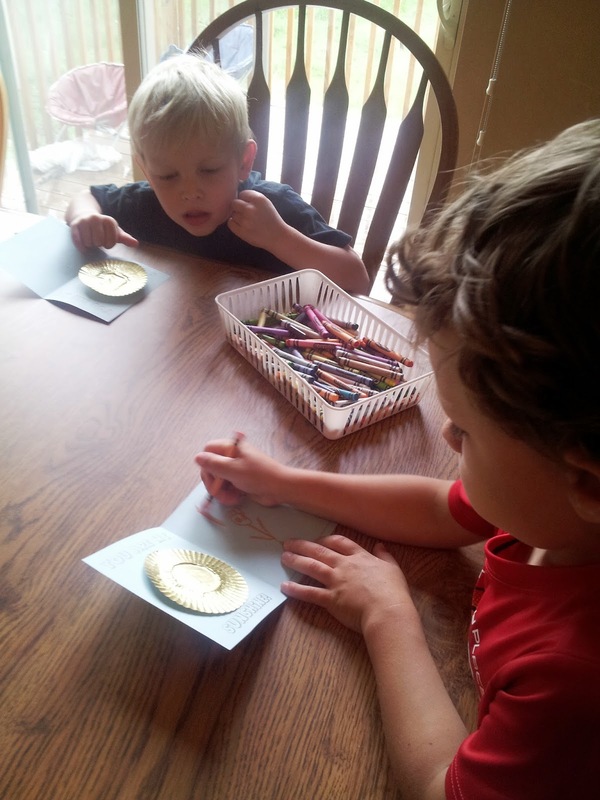 Today we did a fun craft- supplied in my Funshine Express curriculum monthly kit. 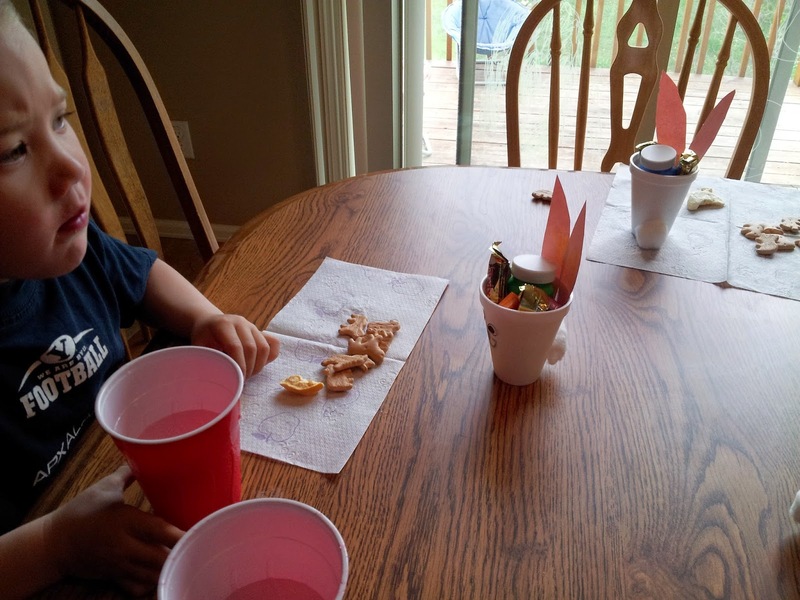 Funshine Express suggested dipping coffee filters in water/food coloring. I gave the kids a choice. 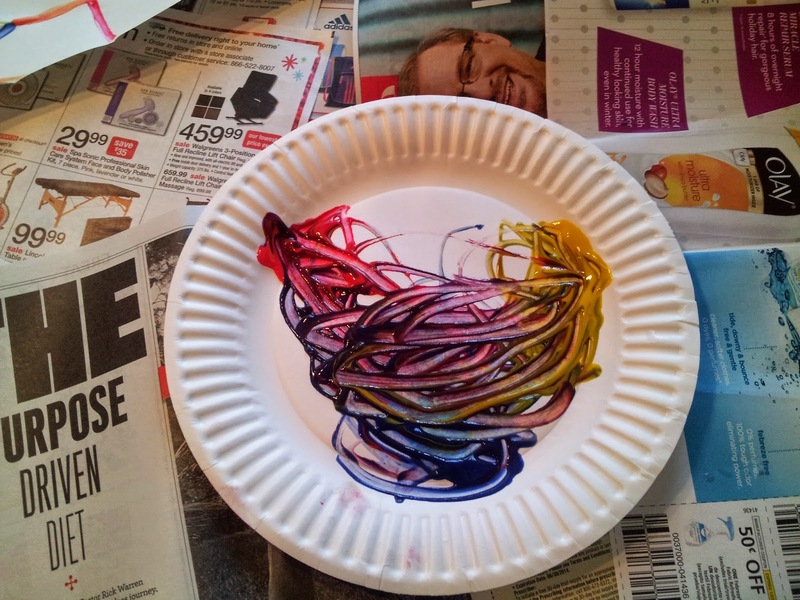 (I didn't think food color in water would be as fun as just painting with watercolors.) 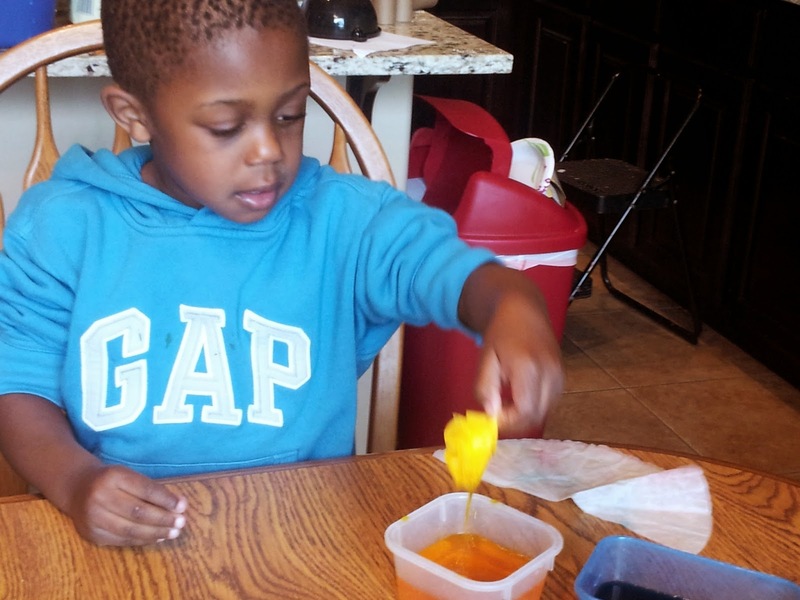 The kids were unanimous- they wanted to experiment with the food coloring/water! 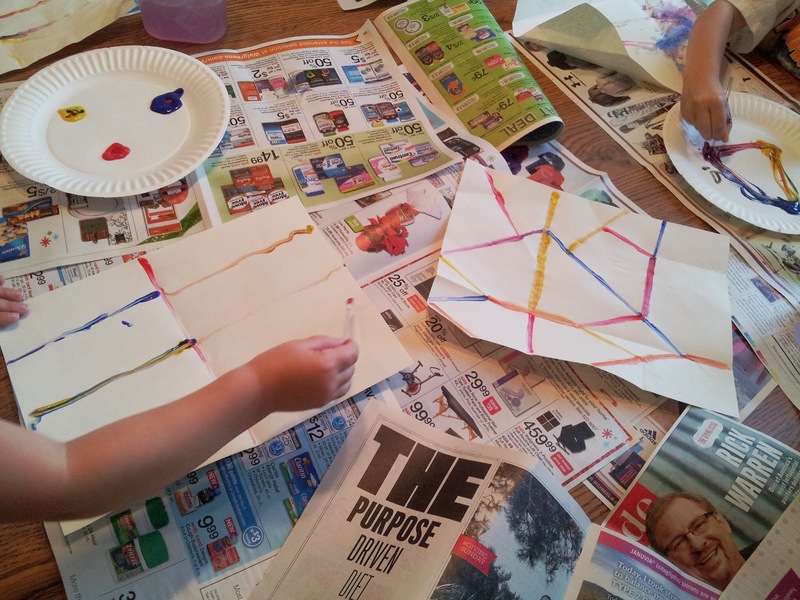 They love the unconventional art projects that Funshine Express provides. The coffee filters are going to be the tops of "umbrellas". 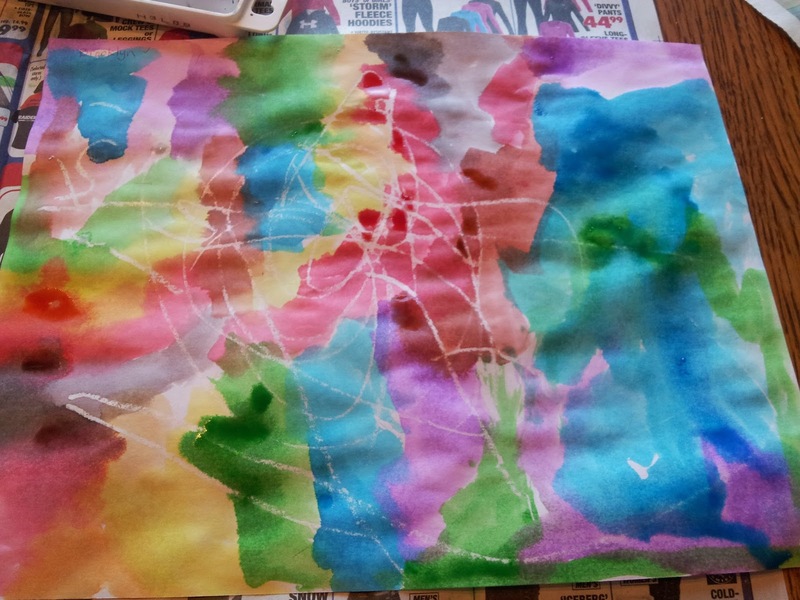 Half the kids worked on the coffee filters while the other half- decorated their paper with finger print "raindrops". We let everything dry while we did our rotations and stations. Then after snack, everything was dry- so we were able to put them together. We read a cute book at story time, called Rain drop Plop! Easter is over, everyone is crashing hard after a sugar rush, and my plastic eggs are still everywhere! (lol). That is okay. We are still talking about eggs in our preschool. Chicks aren't the only thing that pops out of eggs. 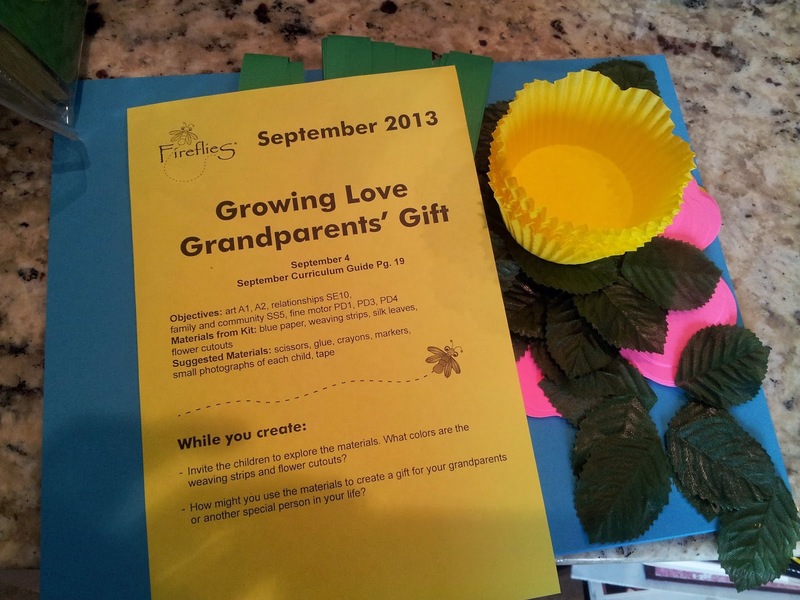 (this is the cute craft we made- provided in my Funshine Express Monthly Curriculum kit.) We talked about what other critters come from eggs. Fish, Snakes, lizards, Alligators, etc... lots of creatures come from eggs. Funshine Express- in their daily curriculum guide- also offer lots of fun activities. Today for science- I filled my plastic eggs with different items and we played a matching game. We had to listen closely! Buttons and safety pins sound a lot alike! The kids really enjoyed this as a group activity, so I also made it a station in our rotations. They really enjoyed finding the matches! The kids really enjoyed every aspect of preschool. Parachute fun! 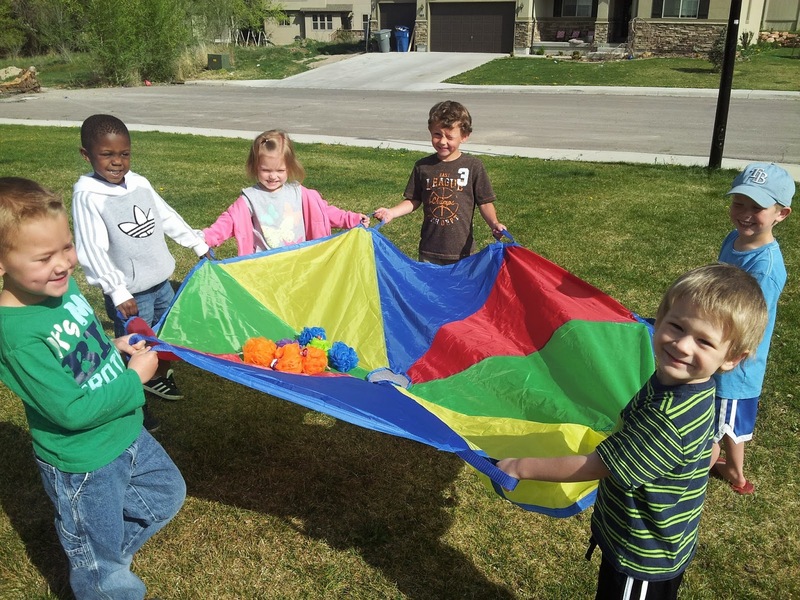 Funshine Express.com often offers ideas of games and activities to play with a parachute. We often used just a sheet or blanket. 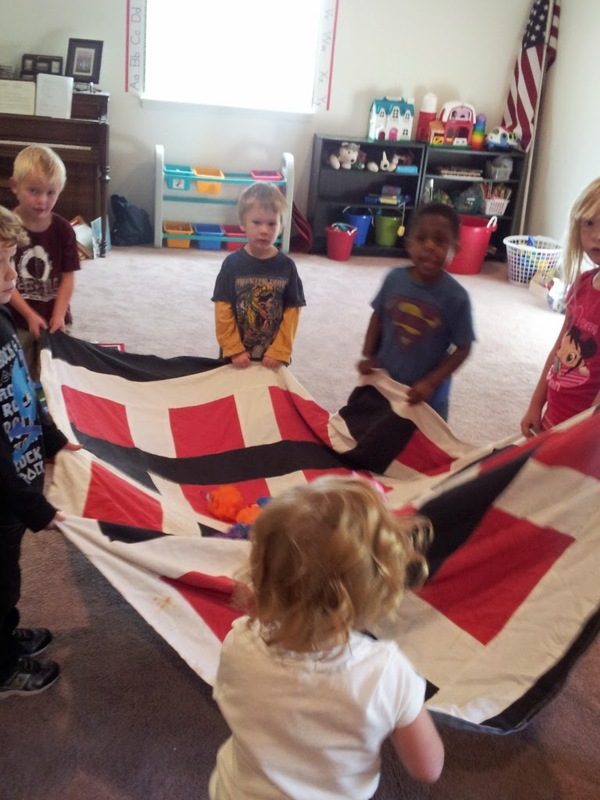 You can imagine my preschoolers delight when Funshine Express sent a real parachute! We have used it a handful of times inside- today was the first day we played with it outside. I am still recovering-- slowly from throwing out my back. You would think I was 100 years old! I'm not. But I feel like this year I have been riddled with injury and illness. I am so grateful for my monthly Funshine Express curriculum monthly kit. Funshine also has supplementary supplies... like parachutes, puzzles and other educational supplies . 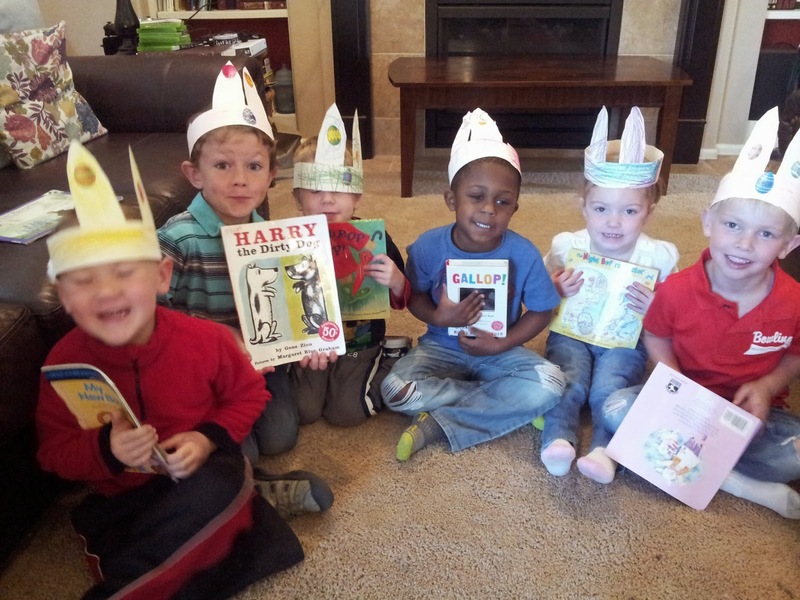 Today we had a fun day- with traditional Easter bunny activities. 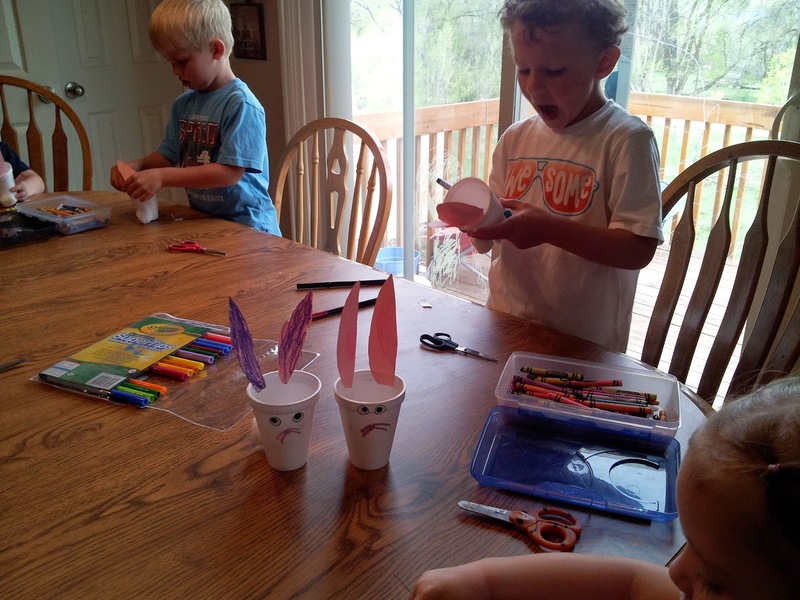 These little bunny cups- was a craft supplied in my Funshine Express monthly curriculum kit. It was so cute- and of course- the kids were so excited to make them to hold their treats! 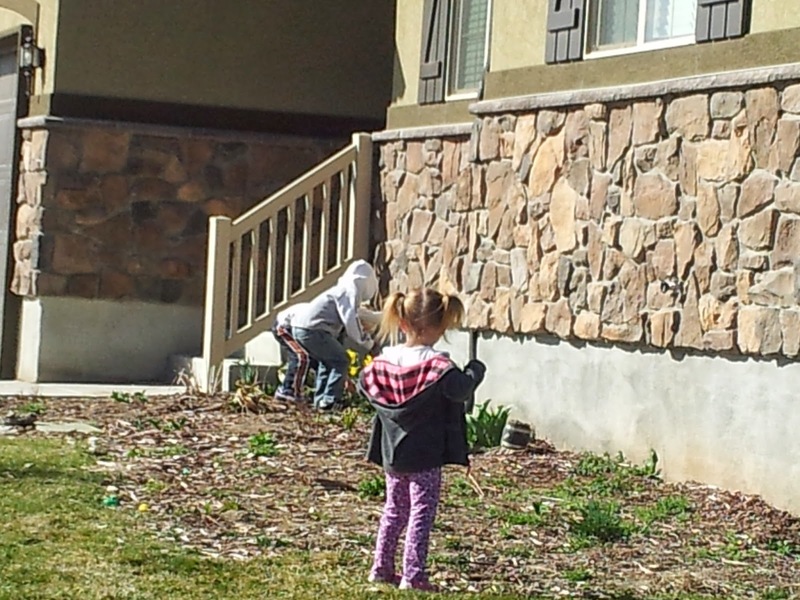 We had a small Easter egg hunt and Funshine Express also had fun activity suggestions for today. 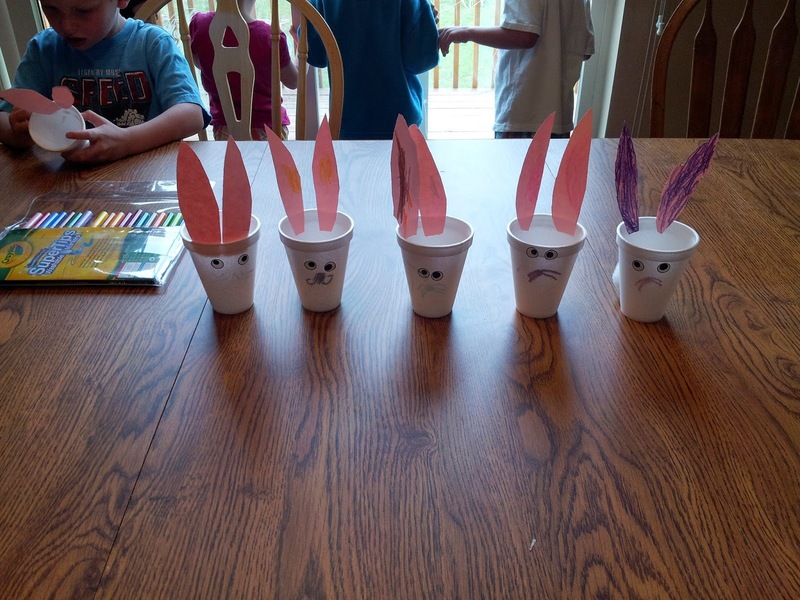 With Easter right around the corner- I am excited to share the cute crafts and activities that Funshine Express has included in their monthly curriculum kit. I love the varied crafts- they are adorable. I also love as I read the monthly curriculum guide they suggest simple prompts to get these little ones talking and connecting to the theme and topic for the day. When we were making these headbands, I remember Funshine Express suggesting to have them touch the fluffy tail we were adding to our headband. (it was really soft and furry). Having a real bunny would have been the best activity- but second best was touching this fluffy tail and talk about bunnies and their fur. 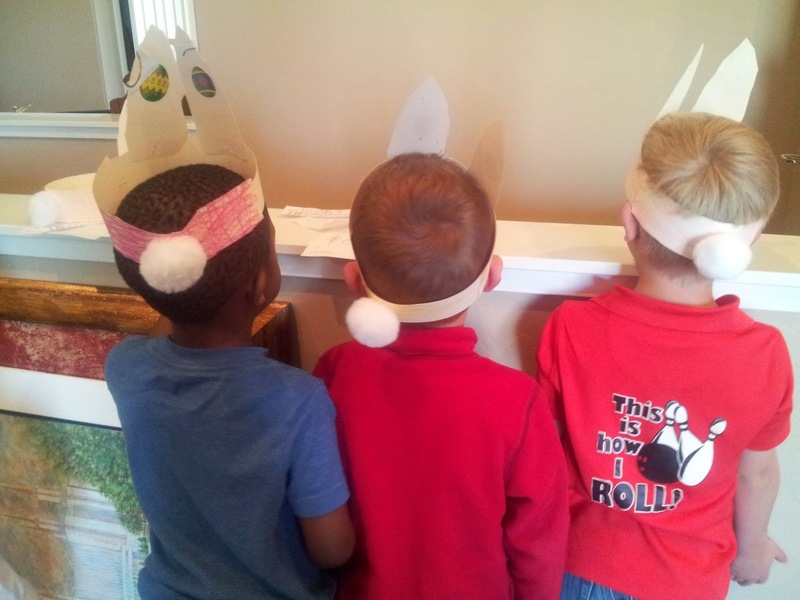 These headbands were a big hit! Last week was Spring Break in our area- and as luck would have it- I sprained my back! The full week I was out of commission! I texted my parents last Friday- warning that we might not have preschool THIS week while I recovered. If I had to do a lot of prep and leg work- we would not have had preschool today. Felt like I could handle the few hours. Just another day- I was so grateful to have Funshine Express monthly curriculum. Another element of my Funshine Express monthly curriculum kit- are the monthly letters cards. There are lots of creative ways to use these cards. Then the child named, reaches in and pulls out one of the little picture cards. They then place the card next to the letter it matches. Last month we started a new activity with these letter cards. I bought some magnetic letters from the dollar store. 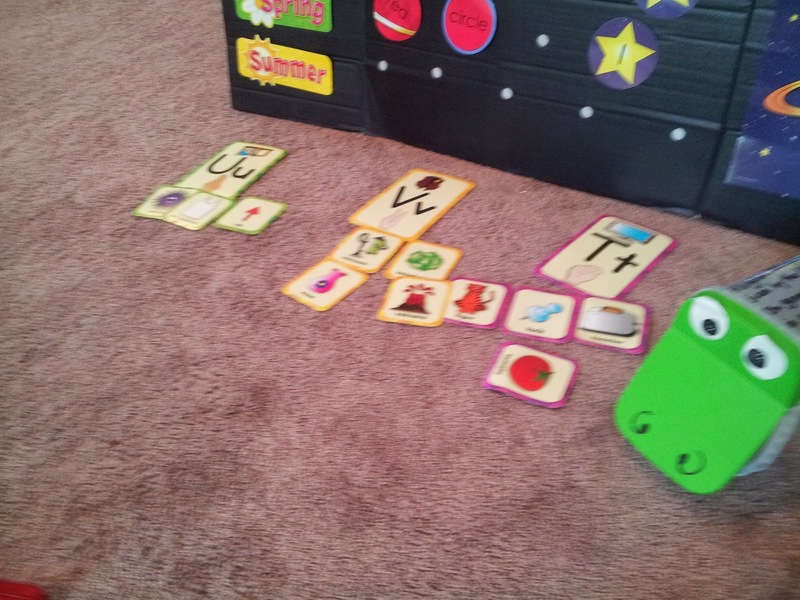 At this station, little ones can pick a picture and match the letters to spell the object. 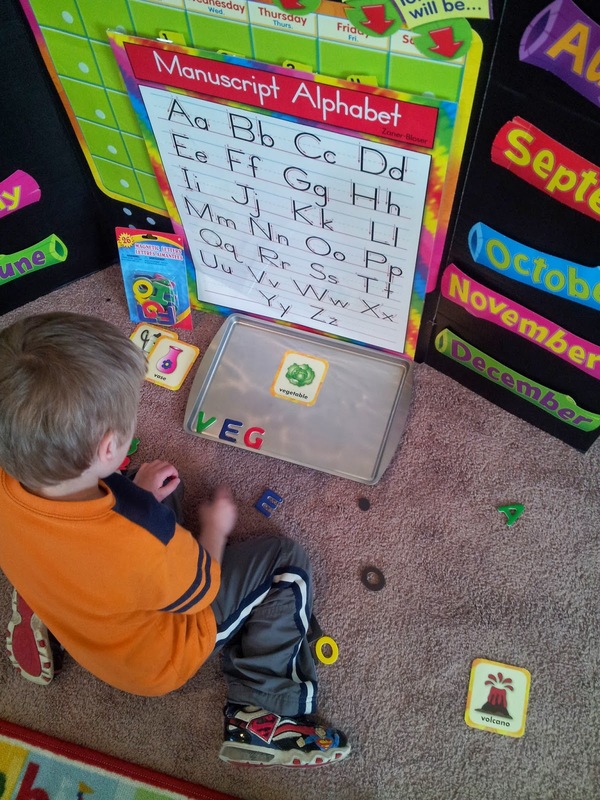 I love how versatile the supplies are in Funshine Express' curriculum kit! There is no limit to the activities you can create around these sturdy and durable supplies! I can use them over and over again for countless activities. This week we are enjoying Spring Break- so no preschool. But I thought I would share some of my favorite elements contained in Funshine Express Monthly curriculum . Every month my Funshine Express curriculum guide suggests a handful of unconventional creative art projects. I don't know why I love it so much. I guess because I am creative. I guess I love the endless possibilities. 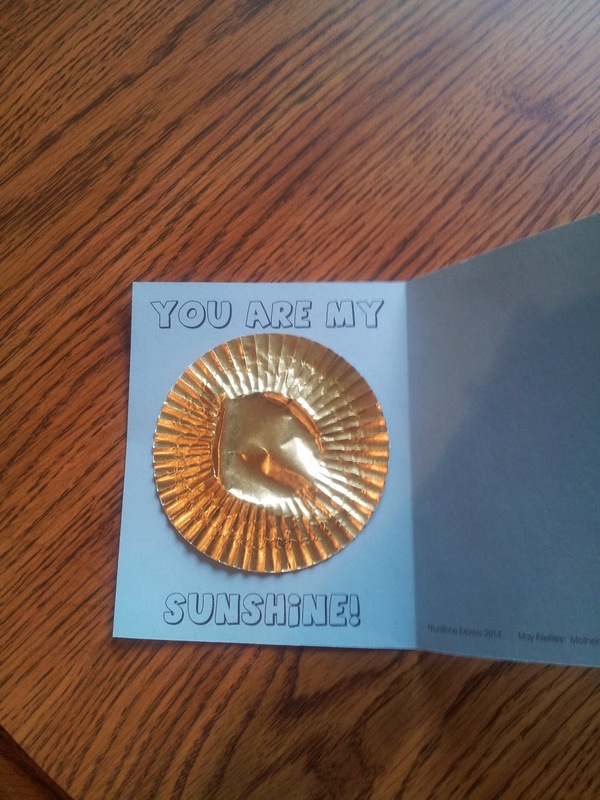 This particular art project- Funshine supplied foil. 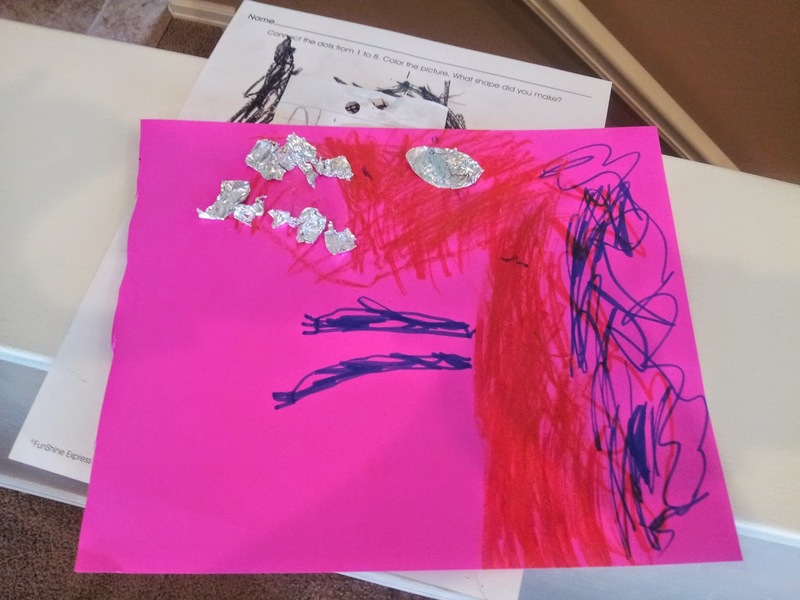 Most of the kids created abstract pictures and used the foil sporadically. One little guy in my class was very thoughtful! He used the foil for his dragons eye and teeth! Today we were talking about the color yellow. I usually try to make play-dough the week I introduce the new color. I dye the play-dough the new color for the month. We can play with it for a few days..
Funshine Express always has a cute color page to go along with the color of the month. Today's worksheet instructed the kids to color the tulips and chick a different shade of yellow. The craft kit I selected to use today- was actually one I didn't use back in September. 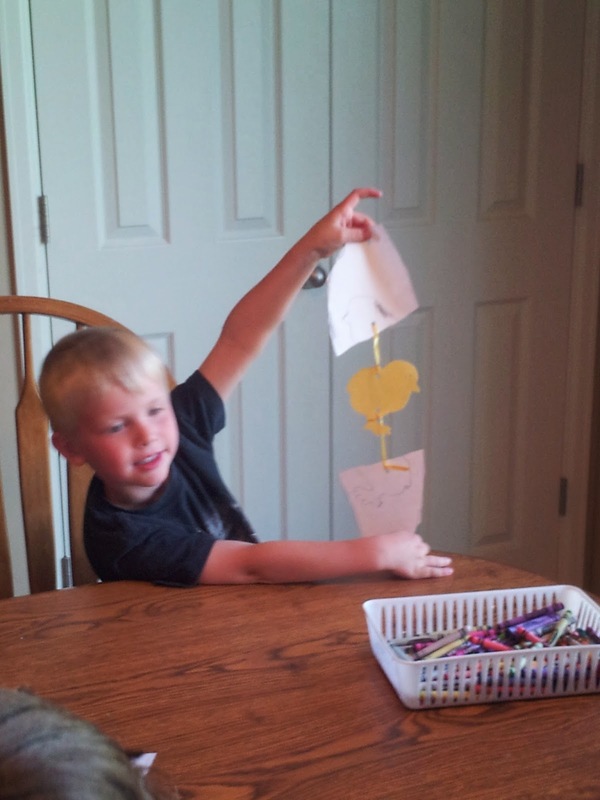 It was a craft to make a card for your grandparents. The yellow "cups" are from a previous kit. They were suppose to be "pots of gold" at the end of rainbows... but the kids didn't use them. So I decided to combine the two- so the kids could make collages. Combining the yellow flower and cup- makes a pretty cute tulip! 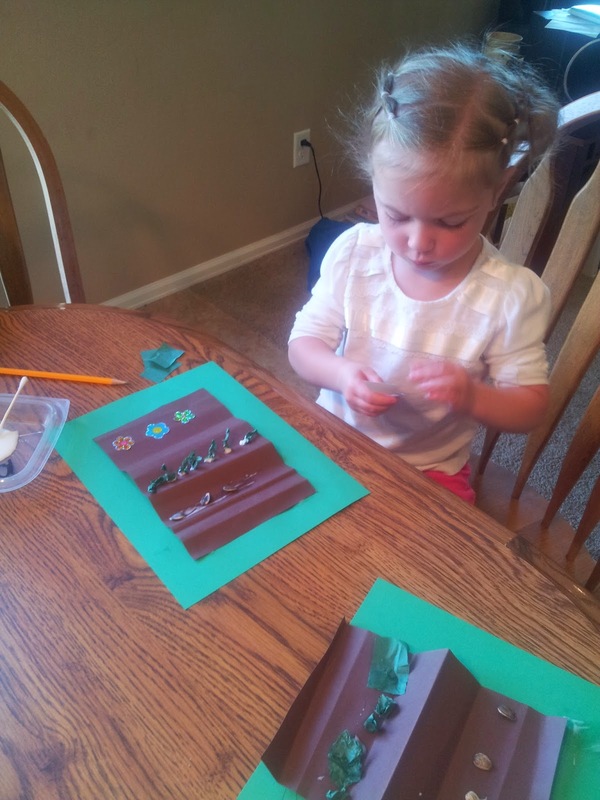 I truly love how versatile the Funshine Express curriculum and craft kits are. I especially love how- I don't have to run around town- collecting supplies for cute crafts and projects! I wake up- happy for a new week. Made lunches for my four boys. Cooked an egg sandwich for my oldest. I was ahead of the game! While the elementary school kids dug into the French toast- I was motivated to quickly "clean out" (toss out the moldy stuff.) the refrigerator and started to sweep our eternally crumbly kitchen floor.... life was good. Then my second grader mumbles with his mouth full, "Mom.. isn't my Animal Report due today?" MY HEART DROPPED- mid sweep~. I have learned the value of having extra poster-boards handy. It was all hands on deck! I am so proud of my 11 year old and 8 year old. They quickly jumped into action! My 11 year old- quickly volunteered to "take care of preschool". He ran downstairs to set up our preschool space. My 8 year old and I quickly printed off the facts he had been collecting. cut- and pasted the facts to the poster... and called it good! By this time, my 11 year old was back upstairs and he said- "Mom, I can entertain the preschool kids for you, while you get your lesson together." And- ya know what?- preschool lesson wasn't even a concern! I mean, normally I like to prepare, gather my supplies, read over the plan for today. But today- when we were in a rush- I wasn't panicked. I knew... whatever Funshine Express had planned...would be great. My craft supplies would be all included- if NOT they would be easy to get from around the house. 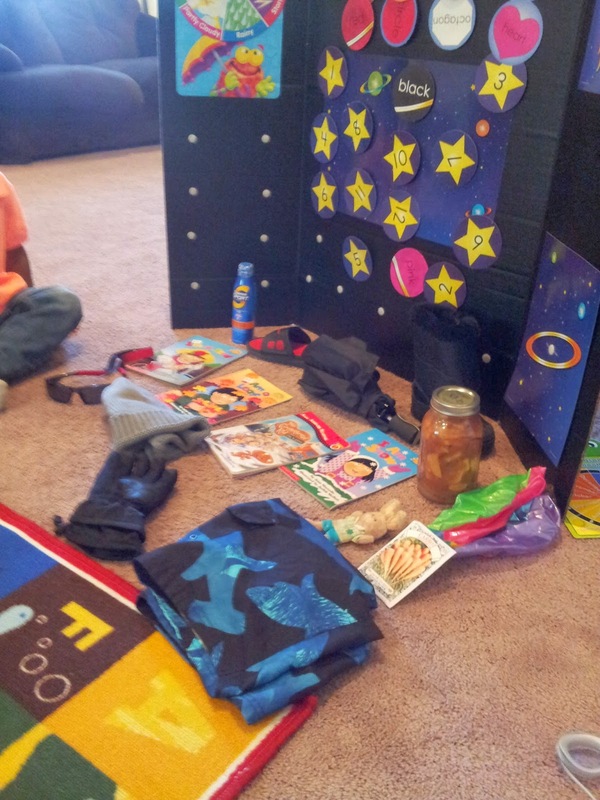 Today I was truly THANKING MY STARS I have my Funshine Express monthly curriculum kit and lesson plans. 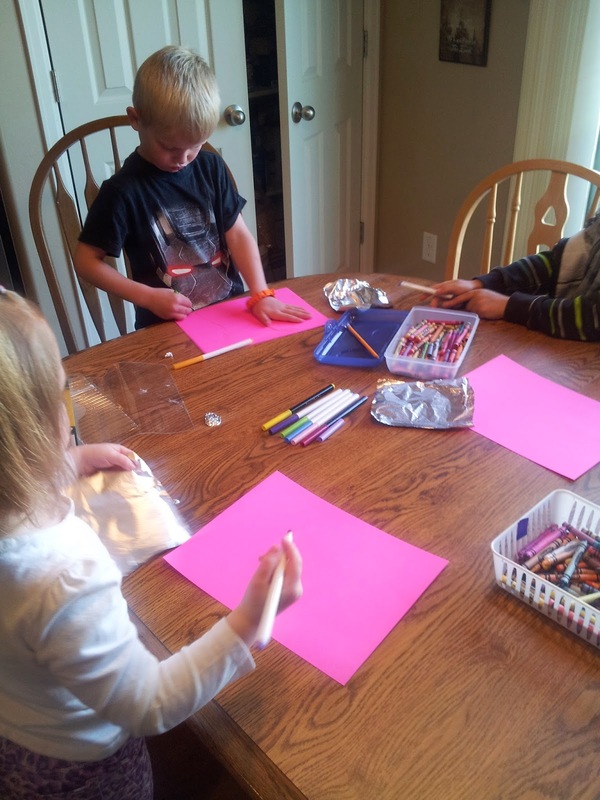 We did a really cute April Fools Day joke/craft- suggested by Funshine Express. I told the kids, "Tomorrow hand one of these papers to your mom, or dad, or big brother, etc.. and tell them this is your best drawing ever!" 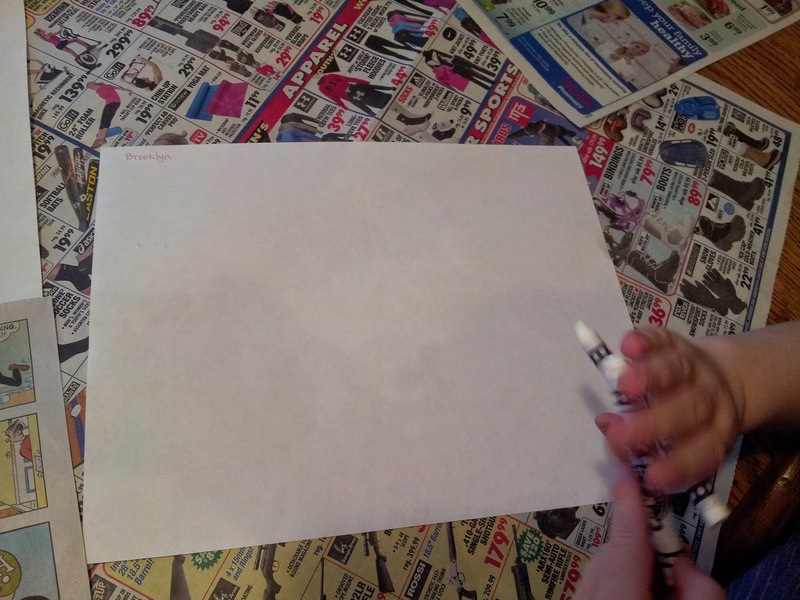 (naturally they will think it is just a blank piece of paper) When you paint over it... the drawing appears! I let the children paint two (of their 4) drawings. So they could practice and see the joke themselves. Whew! Such a life saver today- I can't say it enough! 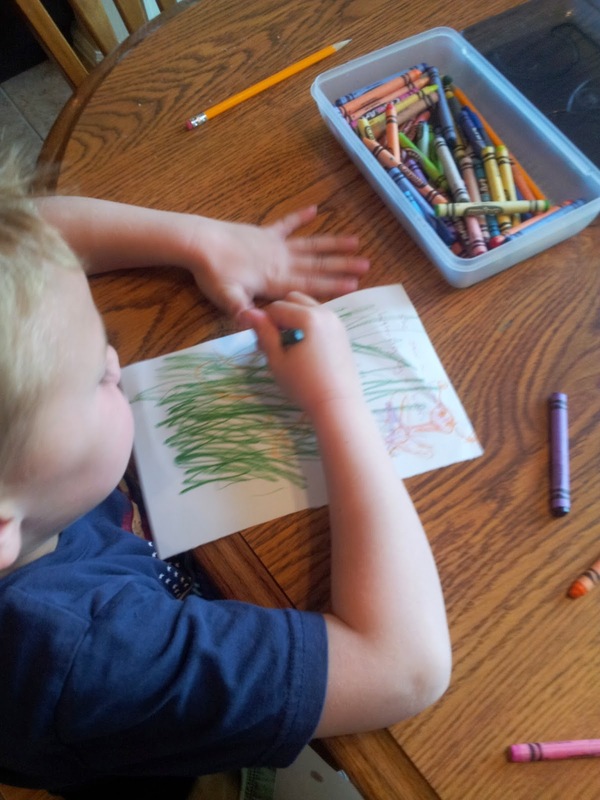 Bad mommy moment - averted, thanks to my Funshine Express monthly curriculum kit! March 2nd was Dr Seuss' birthday-- did you know? Funshine Express planned in their monthly curriculum guide to celebrate his birthday. 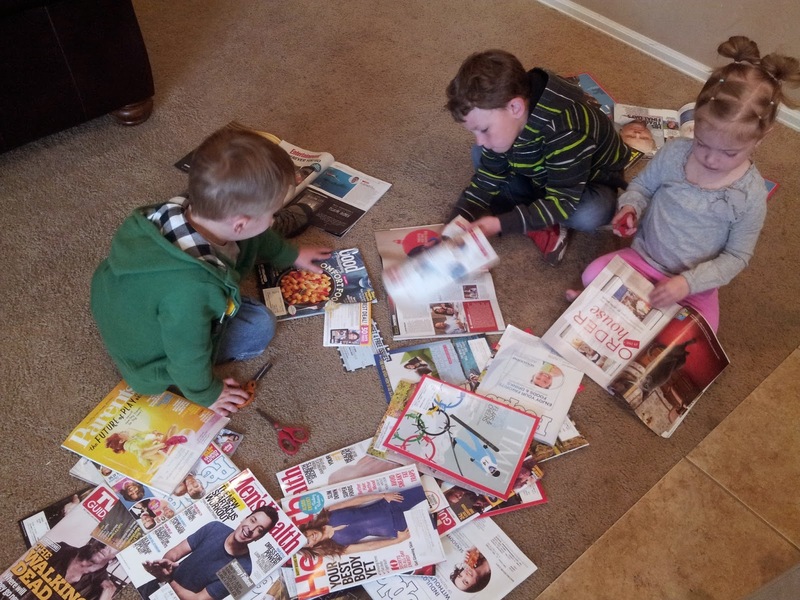 They had a really cute day planned- different activities relating to different books. How I even noticed I had missed a fun day-- was I found an extra craft kit in my monthly curriculum box.. and went back to see what we had missed. Here are the supplies to make Trufflula trees from the book The Lorax. 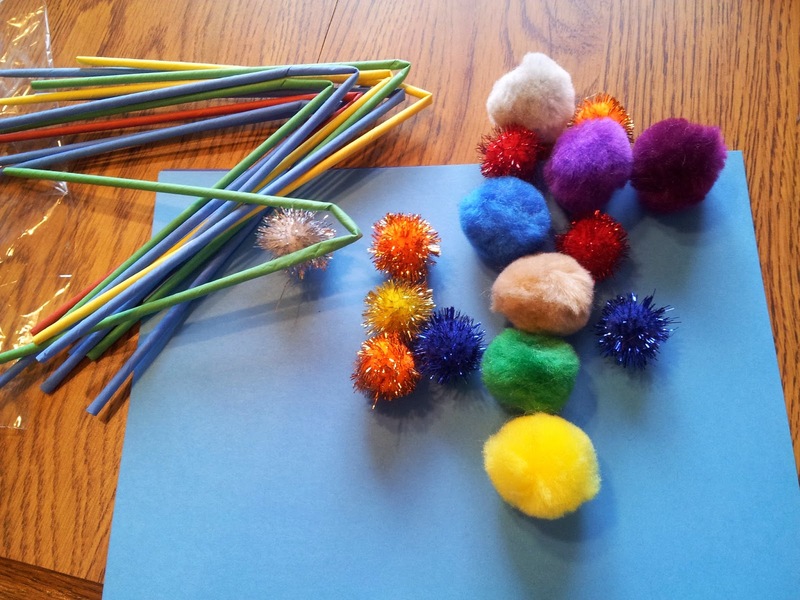 Really- these pom poms could represent trees in any of Dr. Seuss' books. Horton hears a Who.. I am thinking of specifically. The straws were a tad hard to glue on- so we just drew the trunks of trees. Then I modified the craft...by letting the kids make finger-print creatures. I thought these all turned out amazing! Any one of these pictures could be an illustration out of a Dr. Seuss book! Cat in the Hat Balancing Act. It was a really cute day. It is the end of the month- and I chose NOT to do one of the provided themes by my Funshine Express monthly curriculum kit. 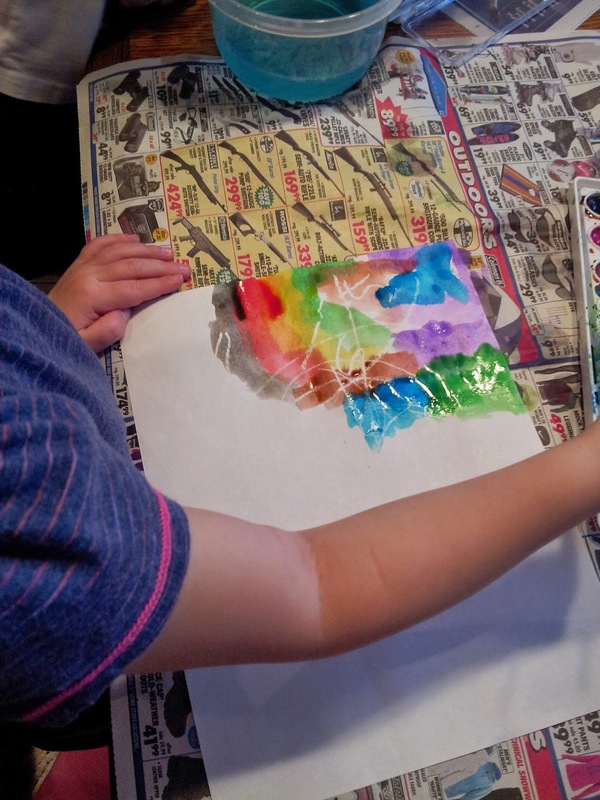 Thankfully- Funshine Express' monthly curriculum guide is always packed with a variety of activities to keep my preschoolers busy- even when I omit one theme! One of the activities they suggested- was Is this Healthy? First we cut out newspaper images of "food". This lead to interesting discussions- what can you eat? I am serious! These little ones are hilarious! We decided you can put a lot of things in your mouth. (...they wanted to cut out buttons, bolts, etc.).. but that is not "food". And there are plenty of things we EAT... (marshmallows, candy bars).. but that aren't necessarily good for us. This was a great activity! They each divided a piece of paper in half. One side we put a smile face and the other side a frown face. Each child got to pick their favorite foods to add to their papers. There is one part of our preschool day- my kids LOVE. I think it is so important- to get wiggles out- especially if you expect little ones to sit still for any length of time. If we do our wiggle time outside- I switch things up a bit. We are ready for drinks of water after a good workout, so I have them sit again at the table and pass out snacks then. These activities often require things you have around the house- if that. Sometimes you don't need anything-- just active bodies- lol. I love- love- love these ideas! 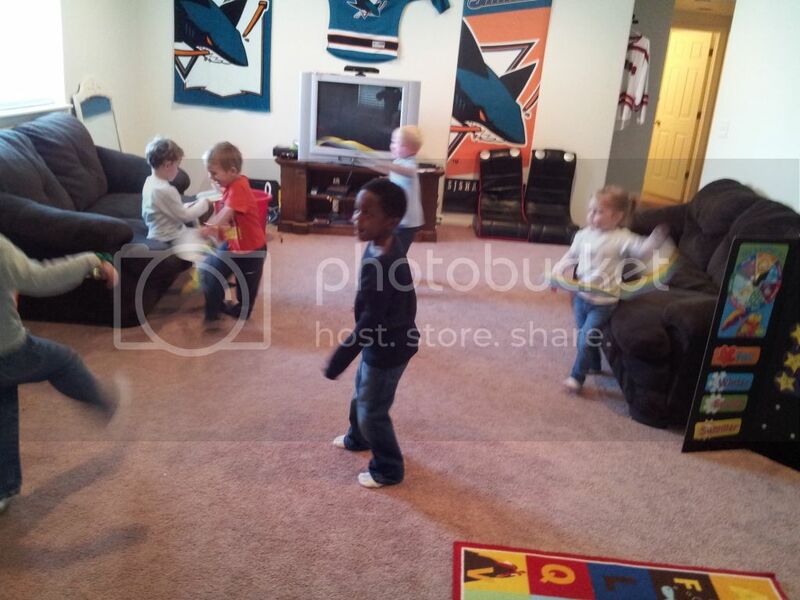 It is so nice to have a new game, stretch, or activity to do with the little ones every day! This month, we have been talking about weather and seasons. Funshine Express suggested a great activity- and simple to throw together relating to this theme. 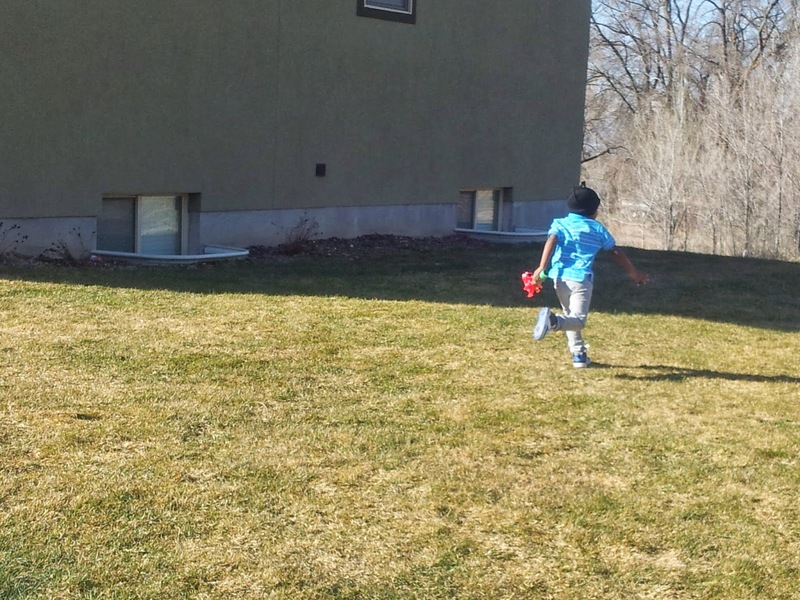 For this activity- walk around and gather items that you use during different seasons. 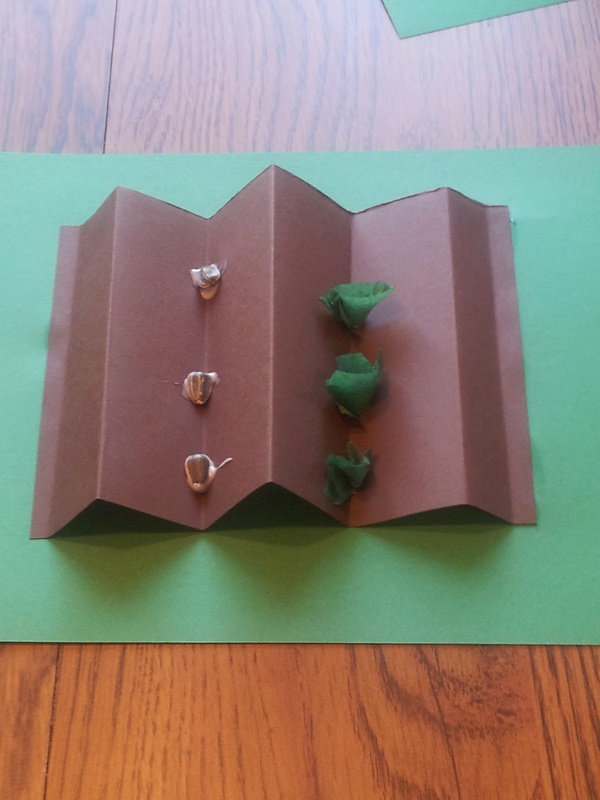 Funshine suggested having four different boxes... letting the kids explore the boxes and then guess the seasons. 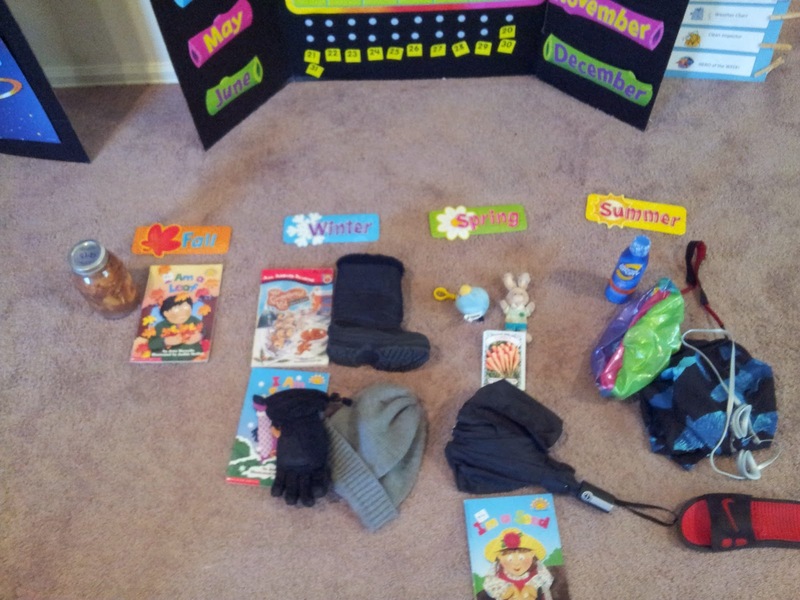 So I gathered objects and then let the kids, take turns picking an item and then placing it with the correct season. It was really fun- and the kids enjoyed talking about the seasons and activities we do in each season. Today we talked about the different symbols that relate to St. Patrick's day. 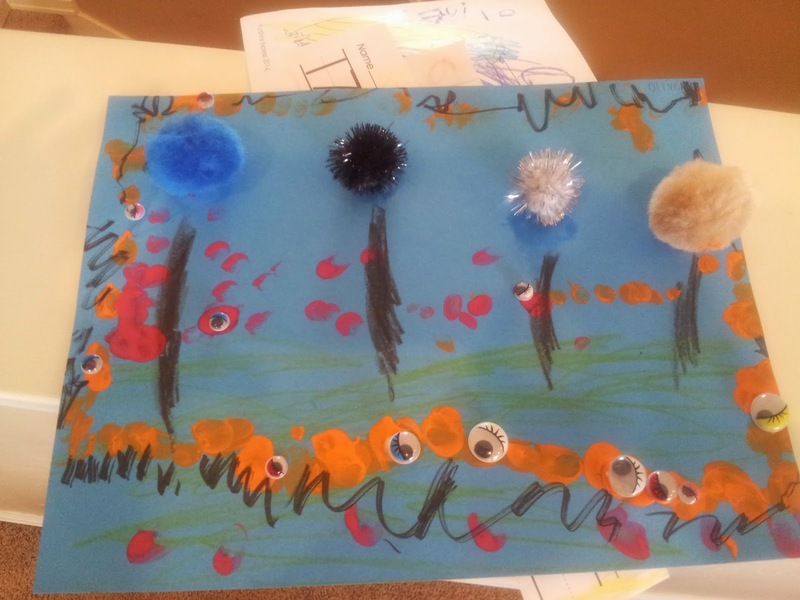 Funshine Express supplied the craft in their monthly curriculum kit- things for this collage. 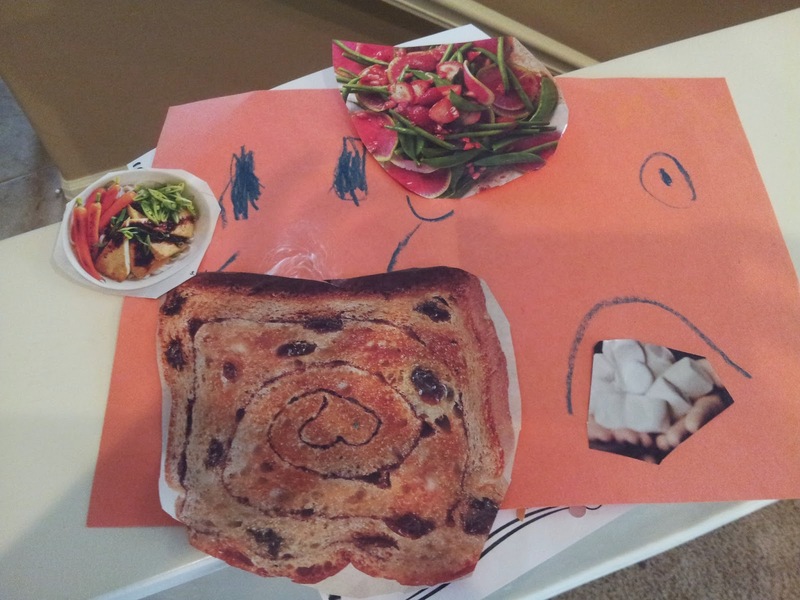 Each child used the elements to create different and unique pictures. It was a really cute day. Everyone dressed in green. 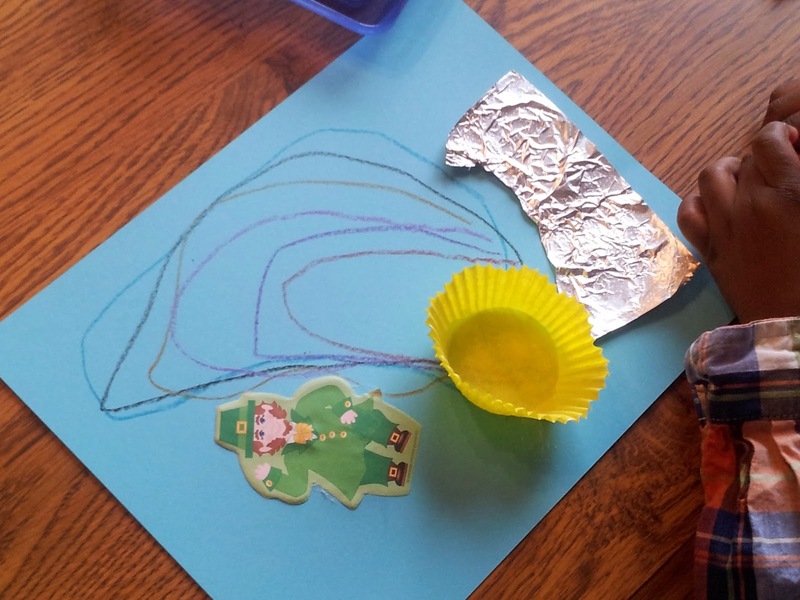 One family has a tradition where they go on a walk looking for the leprechaun's rainbow. I thought that was a cute idea. We didn't do that today- it was so windy! Such a great craft- on such a windy/blustery day! This month we are learning about the shape: Rhombus. 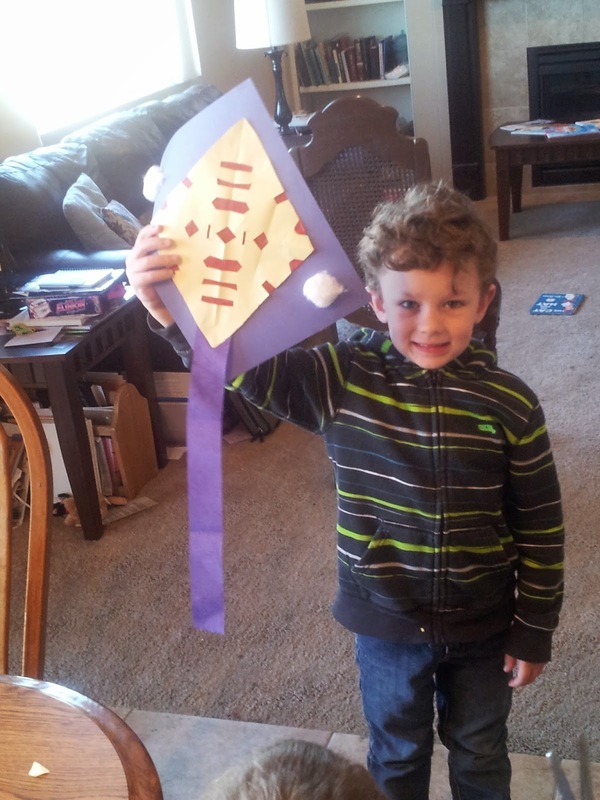 How clever to use this shape to make kites. Our kite kits came from FunshineExpress.com We are continuing to talk about weather. It is so fun to live in a region that has all the season! March really has been filled with extremes. One day windy/stormy/blustery.... even snow, the next day so mild and warm. WELCOME TO OUR BOOK CLUB ROUND UP! Interested in Winning Free Books?If you would like to win a future books and stuff ...Fill out the form below to enter to win! Contact us at Bookclub4boys@yahoo.com to learn more! Great For Bookclub/ Movie Groups!